This may be one of the most ridiculous things I’ve ever made. 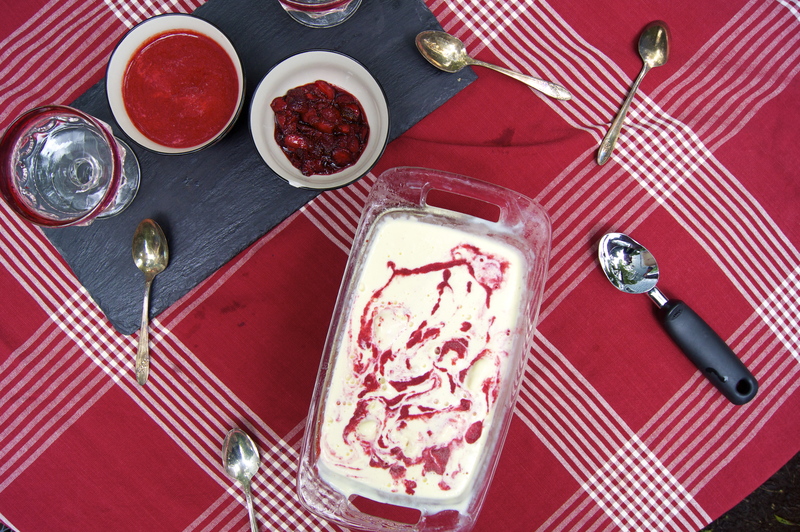 It’s like strawberry cheesecake in a bowl, an indulgent upgrade, as if ice cream wasn’t decadent enough before. Goat. Cheese. Ice. Cream. Seriously? I suppose it may sound a bit strange, but trust me on this one. It’s delicious. 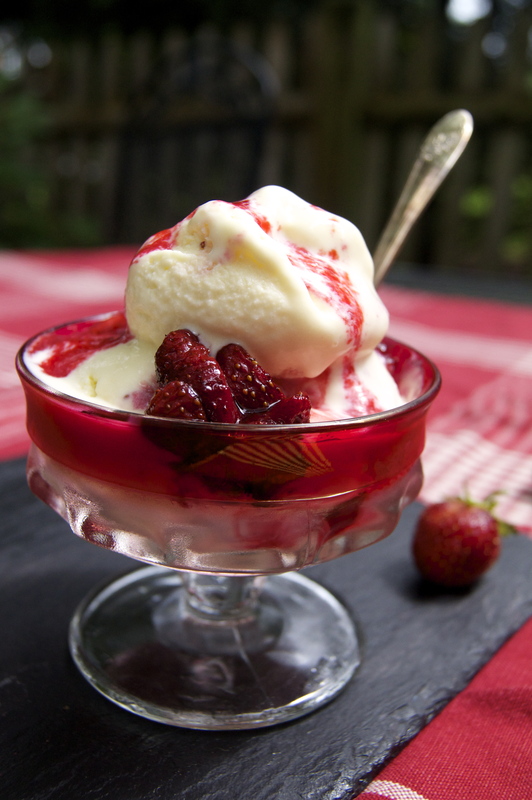 And you have to have strawberries or some other wonderful, fresh summer fruit with it. Roasted strawberries make it amazing! I adapted this ice cream recipe from David Leibovitz’s The Perfect Scoop, adding in a fresh strawberry swirl to his goat cheese ice cream base. This is now my third time making this. I rarely have the patience to make something multiple times before posting it — typically, I’m just so excited about whatever it is I made that day, and happy enough with it for my purposes (eating), that I just post it as soon as possible. However, I really wanted to get this one just right. Initially, I had added bits of fresh strawberries into my first batch, but I now realize that just doesn’t offer the flavor I was looking for. Too much iciness. I’m even not sure if I’d bother adding the puree in next time. It kind of pains me to freeze the puree in the heart of summer, when it would be so much more tasty to drizzle the puree on top of a freshly scooped bowl. Or get a little crazy and roast some strawberries for a homemade berry sauce…yes! From David Lebovitz’s The Perfect Scoop – an amazing ice cream book! Makes 3 cups — not a lot, but it is a very rich ice cream. If you choose to double the recipe, you may want to churn in batches. Doubling the recipe filled my ice cream machine completely, which left it slightly unable to churn as well as it normally would have. Warm the milk and sugar in a medium saucepan. Crumble the goat cheese into a separate bowl while the milk and sugar are warming, and set a mesh strainer on top of the goat cheese. In another bowl, whisk the egg yolks and slowly pour the warm milk & sugar mixture into the yolks, constantly whisking. Pour every last yummy bit of the combined mixture back into the saucepan. With a heatproof spatula, constantly stir the mixture over medium heat, being careful not to cook the eggs. Be sure to scrape the bottom and sides of the pan, and cook the custard just until it coats the back of the spatula. You’ll know that it’s done when you swipe the spatula with your fingertip, and custard does not fill in that spot. Pour the custard through the mesh strainer into the goat cheese and stir until it melts completely. Stir over an ice bath until cool — this is when patience is key, because I find it SO hard to not keep taking sample tasters of the custard. Just wait, just wait! Before churning, chill in the fridge until truly cold. Try your hardest to not just steam ahead and make it when it’s not quite cold enough; you’ll end up having to wait longer anyway while it cools in the freezer if you do that, whereas it would be done right out of the machine otherwise. Freeze in your ice cream machine and churn to the manufacturer’s specifications. Transfer the ice cream into the container you’ll freeze it in; I’m using a rectangular glass Pyrex pan. If you choose, fold in a few swirls of the puree, but it really is tastier with fresh puree or roasted strawberries on top. So yummy! This will make enough strawberries to make you – or your guests – happy for some time. Simply wash 2 pounds of strawberries, pop off the tops, slice into halves or thirds, and spread out onto a pan in one layer. Drizzle 5 tablespoons of raw, local honey on top and pop in a low oven (300 degrees F) for an hour and 45 minutes. You’ll get a delicious sauce that’s perfect on all sorts of desserts – keep in the refrigerator for about a week, but good luck having it last that long. If you’re only making one batch of the ice cream, you may only need to do a pound of strawberries and 2.5 tablespoons of honey. These berries would also be delicious as a tartine with mild cheese and toasted sliced almonds! Or grilled cheese. Voila – goat cheese ice cream! Hi! I can’t believe I never responded to this. Thank you so much for your kind words, that is so sweet of you! I have a lot of fun playing around with my blog. Thanks for checking it out!